6-11 course tasting menu, available with or without matching drinks. We attended their final 2018 pop up and it was amazing. The idea of eating outside of a restaurant environment was so much fun. The food and wine pairings were excellent. My favourite dish was the butter poached river trout and porridge of grains!! Whole new level of flavour. Came here after seeing it online and thoroughly enjoyed myself. Tasting menu incredibly well balanced, service very attentive and most importantly, everything was just DELICIOUS! This was a fantastic experience. Midweek degustation could not have been better. We were made to feel incredibly welcome the moment we stepped through door from the dark, empty car park outside. The room was terrific and the location in the heart of Paddington on a chilly winters night with the smell of fire was perfect for our first pop up experience. And the food matched (or perhaps surpassed) the people and the place. We wish their was more than 5 courses, but we have already booked into their next pop up to experience it all over again. Everything they rave about and more!! Describing this place using fancy words, will not give Black Ox justice. This pop up restaurant was hidden down a secluded stone courtyard behind a beautiful hedge, the sign was really small, and the the black steel gate small and unmarked. As soon as we entered the courtyard.....Bang!!! The perfect hideaway restaurant! What an experience. The food, fresh, simple ingredients presented and made to taste in away that no explanation would give justice. Rachael the waitress was excellent, every course was explained in depth to help bring the story of each course alive, the pairing of the wine was perfect each wine complimented perfectly with each course......and that ginger beer from their beekeeper!! couldn't get enough. If your wondering what we had , We had their 7 course menu with the matchings of course. A small Restaurant that is definitely worth searching out. Degustation menu was excellent, and Chris has done a fantastic job of creating dishes of few ingredients where the flavours really pop. Definitely a restaurant worth seeking out! One of the negatives of looking to move to coastal Queensland is the lack of alternatives to innovative dining that we currently have in Sydney. Tasting menus can sometimes be endurance test, but Black Ox in Brisbane doesn't put you through this. Their 7 course menu is quality, flair, innovation and value. The opening course of house baked rye & spelt bread with house churned butter was superb - fascinating was the story behind the grains for the flours, and the quality showed. The next dishes of Lamb, Peas, Wild Whiting and Beef showed a great diversity of styles and tastes. Excellent value at $140 for the quality. Such a wonderful dining experience. Every single morsel was delicious. There's not one thing I could fault in their service, food or drinks. Chris the Chef was Super friendly and came by our seat and wished my Wife a happy birthday. Chris and his team have created a truly wonderful atmosphere and an amazing experience. 5 of us took part in their most recent Pop Up degustation, and 5 of us walked away absolutely delighted. An experience that no description can do justice. Highly recommend letting these guys take you on their unique gastronomic journey! 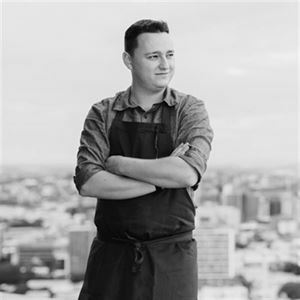 In a city with a changing dining culture, Black Ox Dining might just be on the way to being the best dining experience in Brisbane. At $140 per head including wine pairing it is exceptional value when compared to the likes of Urbane. The food is exquisite, only bettered by the friendly, highly professional service. Brilliant. We arrived on a hot Wednesday night for Valentines dinner. Enjoyed the originality of the dishes and the careful preparation of the quality ingredients. Service was very good, and the menu was the perfect size with a few snacks thrown in. We could see into the kitchen from our table and the teamwork was a pleasure to watch. Everything was enjoyable including the spritz at the end. Can't wait till there next Pop Up in Thorneside! Sublime, interesting, innovative night. Degustation was exceptional. Staff attentive but not intrusive. Fine dining done right. Couldn't have been more enjoyable! Beautiful historic venue in the old Tramway Substation. Impeccable food and wine. Would be great to have some cocktails or similar part of the menu, but was definitely worth dining at. Not something you'd come across every day in Brisbane. You need to really search for this hidden gem of the Brisbane food scene, but you would as they are a pop up! Ambience - Black Ox Dining has a very chill vibe, which is unusual as you are enjoying a degustation menu, but i think it is a nice touch that make this sort of dining more approachable. Service- Absolutely wonderful! The two wait staff are very active and have great knowledge and passion for what is being served. Food- Excellent and Thought Provoking. Each course has a story about it, and it should as the Chef says everything is organically grown in there gardens or from growers in Queensland. We really enjoyed experiencing a new style of food and cooking. Is a place worth trying if you are a foodie and want to experience something new in Brisbane. We will be watching for new events in the future! I wanted to experience something a little different and the last pop up 'cooking with fire' was exactly what i was looking for. The food was amazing and you could see the effort the chef had put in. I will definitely be attending more events. Had such a wonderful experience, the food was unbelieveably modern and tasteful. Compliaments to the chef! Love his vision and how he can offer something a little different which sets him apart from the crowd! A dining experience for food and wine lovers in an unique location that will exceed expectations. Food is delicious and is served by people who have excellent customer service . Very happy would attend again.